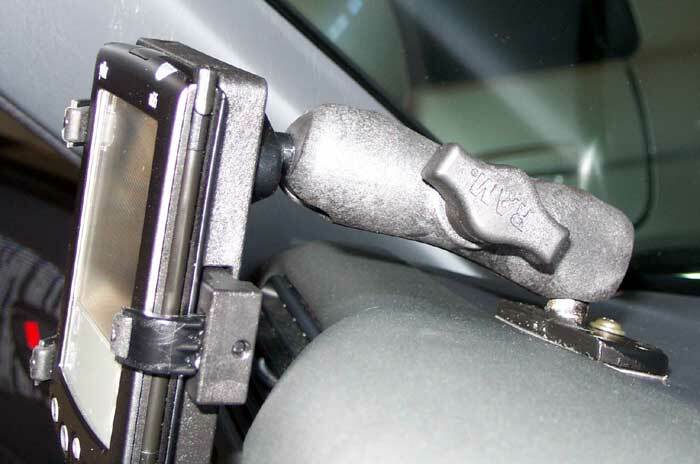 These pictures show the mountings of my Palm Device that sports the Rav4INFO program. My first attempt at mounting (V1) can be found here. Main Rav4INFO page found here. Note: Cathy Sexton is working on a new OBD2 monitoring device. Follow the progress here. These next two pictures are taken through the (dirty!) windshield to show the mounting base, and how I cut it flat on one side. 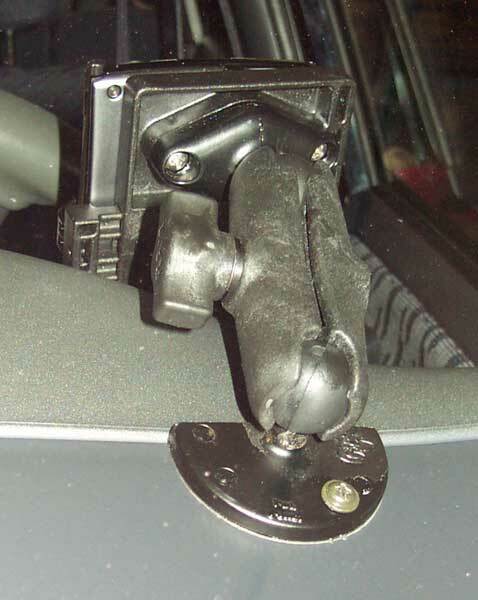 A single self-tapping screw was used into the plastic of the dash to assure no movement. 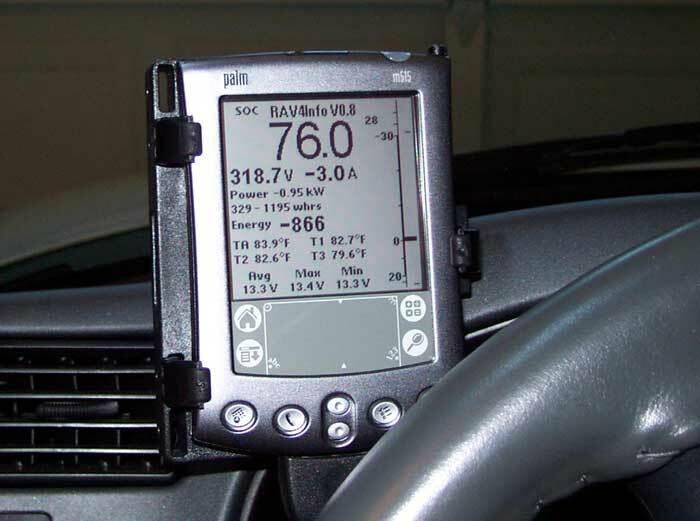 Below is the OBDII and 12V connection for the Palm. Tough angle on this one. This is taken with my head on the floor in front of the driver's seat - looking up under the dash. 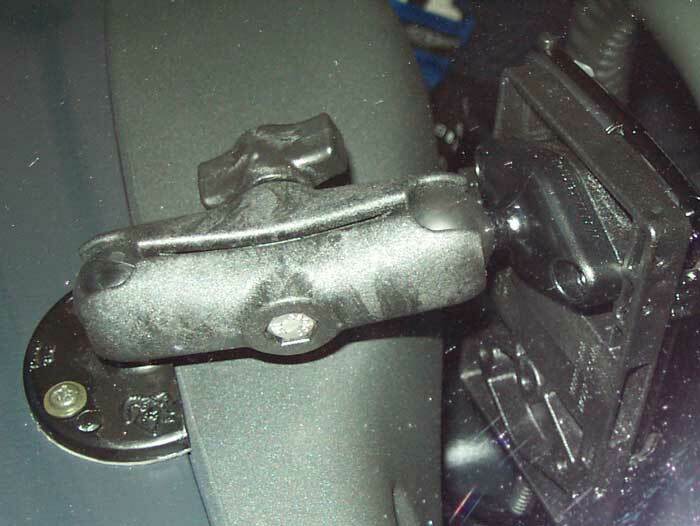 Metal bracket on the right is for the brake pedal. The over-exposed white block is the OBDII port adapter of the Rav4INFO (Michael Schwabe calls this the "interface"). 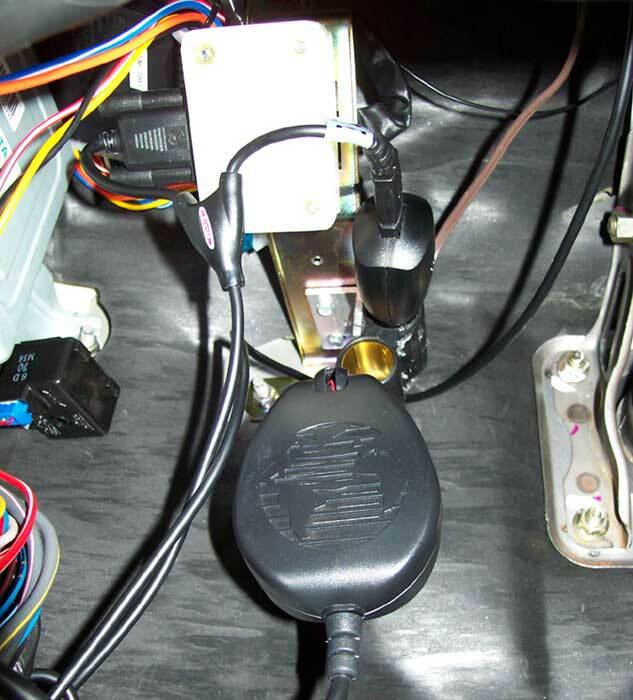 Below and to the right is a three-port 12V power outlet that I screwed to the OBDII support brace. Plugged into the top port is my 12V-5V USB transformer. The USB end of the Y-cable for the Palm is plugged in there for power. The Serial end is plugged into the interface. The bottom 12V port is occupied by the power/speaker plug of the Garmin GPS. The best choice of Palm device to run the Rav4INFO software in the car is the M5XX. These devices draw just a few milliamps when the back light is off. Some offer color or B&W displays. The M515 is brighter than the earlier generation (m505) color model. The M515 is the one I use and recommend. The display is high-contrast, and the back light can be turned on low, high or off. When the battery needs to be replaced (mine lasted 6 years of constant use in the car) find the battery and special tools on eBay. The M130 will work as well, but has proven to be less durable. The M130 also requires the back light to be on whenever the Palm is on which limits the usefulness of the device when the device cannot be powered externally. While driving, a good rough way of knowing that you're being efficient is to make sure that your Amperage reading is at or below your speed in mph. Constant duty rating for the motor is 30 kW. Peak is 50 kW. You don't want to be driving at a constant draw above 30 kW, though exceeding it for hills and acceleration is obviously part of the program. No matter what your SOC, when you start to see your minV drop below 10V, you are EMPTY. Back way off and get on a charger ASAP. In general, the battery V's should all remain tight (0.2V difference and under from max to min) for the entire SOC range. When the gap starts to grow, you are getting near the end. When the gap gets significant (>1.0V) then you need to back way off and get it on the charger ASAP. If you are seeing >0.2V with high SOC, it is a good sign that the car needs to level. Leveling can give you a bit more range, but at the expense of beating up your batteries with two hours of overcharge. Try like heck to keep all temps below 110°. Drive gingerly if temps get up there. If battery temps are above 100, that's not the time to start charging. The front battery row (tray1) will almost always be warmer than tray2 which will be warmer than tray3. Welcome to single-direction air cooling. After a cold soak over night followed by a mid-day drive in the sun, the batteries can be cooler than ambient. Touching the accumulated energy field twice resets it to zero. Touching the large font info at the top will allow cycling of that information through several fields.